In-service conformity testing represents one of the building blocks of the type-approval procedure and allows for the verification of the performance of emission control systems during the useful lifetime of vehicles. In accordance with Commission Regulation (EU) No 582/2011 (2), the tests are performed by means of portable emission measurement systems (PEMS) which assess the emissions in the normal operations of use. The PEMS approach is equally applied to verify off-cycle emissions during the type-approval certification. Regulation (EU) No 582/2011 states that any additional requirements with respect to the off-cycle in-use emissions testing procedure should be introduced after the assessment of the test procedure specified in that Regulation. The Commission has therefore performed an in-depth analysis of the testing procedure. That analysis has identified a number of shortfalls which undermine the efficiency of the European type-approval legislation and need to be remedied in order to ensure the appropriate level of environmental protection. Emission performance of vehicles in a warm-up period is currently not assessed under the type-approval demonstration test or under the in-service conformity test. In order to address the existing knowledge gap and to prepare a new testing procedure for cold start operations, a monitoring phase during which data from type-approval and in-service conformity tests will be collected should be launched. In accordance with Regulation (EU) No 582/2011, replacement pollution control devices are to be type-approved in accordance with Euro VI emission requirements once the specific durability testing requirements are introduced in that Regulation. It is therefore necessary to lay down a procedure which will properly assess the durability of those replacement parts entering the Union market and to ensure that they meet environmental requirements compatible with those set for similar systems produced as original vehicles' parts. A test procedure based on the accelerated ageing of replacement pollution control devices due to thermal and lubricant consumption effects meets the objective of addressing durability of replacement pollution control devices in an accurate and objective manner and is not excessively burdensome for the industry. Regulation (EU) No 582/2011 sets out requirements related to the measures that need to be introduced by vehicle manufacturers in order to prevent tampering with emission control systems. Those requirements should effectively address the most common means of tampering without imposing an excessive burden on the industry. References to international standards in Regulation (EU) No 582/2011 should be updated. In order to ensure a sufficient lead time for the vehicle manufacturers to modify their products in accordance with the new requirement on the power threshold, that requirement should take effect on 1 September 2018 for new types and on 1 September 2019 for all new vehicles. It is appropriate that the new requirements for the in-service testing do not apply retroactively to engines and vehicles which have not been approved in accordance with those requirements. Therefore, the new provisions set out in Annex II shall only apply to the in-service conformity testing of new types of engines and vehicles which have been approved in accordance with the amended version of the Regulation (EU) No 582/2011. Regulation (EU) No 582/2011 should therefore be amended accordingly. 1. With effect from 1 September 2018, national authorities shall refuse, on grounds relating to emissions, to grant EC type-approval or national type-approval in respect of new types of vehicles or engines tested using procedures which do not comply with points 4.2.2.2 and 4.2.2.2.1 and 4.2.2.2.2 and 4.3.1.2 and 4.3.1.2.1 and 4.3.1.2.2 of Appendix 1 to Annex II. 2. With effect from 1 September 2019, national authorities shall, in the case of new vehicles which do not comply with points 4.2.2.2 and 4.2.2.2.1 and 4.2.2.2.2 and 4.3.1.2 and 4.3.1.2.1 and 4.3.1.2.2 of Appendix 1 to Annex II, consider certificates of conformity issued in respect of those vehicles to be no longer valid for the purposes of Article 26 of Directive 2007/46/EC and shall, on grounds relating to emissions, prohibit the registration, sale and entry into service of such vehicles. Annex XIV is amended in accordance with Annex VI to this Regulation. With the exception of point 8(c), which shall apply to all vehicles as from the entry into force of this Regulation, Annex II shall apply from 1 January 2017 to new vehicle types. Done at Brussels, 20 September 2016. (1) OJ L 188, 18.7.2009, p. 1. (2) Commission Regulation (EU) No 582/2011 of 25 May 2011 implementing and amending Regulation (EC) No 595/2009 of the European Parliament and of the Council with respect to emissions from heavy duty vehicles (Euro VI) and amending Annexes I and III to Directive 2007/46/EC of the European Parliament and of the Council (OJ L 167, 25.6.2011, p. 1). be liable to meet the requirements of in-service conformity specified in Annex II on the fuels declared including any blend between the declared fuels and the market fuels included in Directive 98/70/EC and the relevant CEN standards. At the request of the manufacturer, the requirements set out in this point shall be applied to fuels used for military purposes. For the purposes of point (a) of the first subparagraph where the emission tests are performed for demonstrating compliance with the requirements of this Regulation, a fuel analysis report of the test fuel shall be attached to the test report and shall comprise at least the parameters specified in the official specification of the fuel manufacturer. (*) Directive 98/70/EC of the European Parliament and of the Council of 13 October 1998 relating to the quality of petrol and diesel fuels and amending Council Directive 93/12/EEC (OJ L 350, 28.12.1998, p. 58).’;"
‘In the case of application for EC type-approval of an engine or engine family as a separate technical unit the general part and Parts 1 and 3 shall be filled in. In the case of application for EC type-approval of vehicle with an approved engine with regard to emissions and access to vehicle repair and maintenance information the general part and Part 2 shall be filled in. Section 3 of the EC type-approval number issued according to Articles 6(1), 8(1) and 10(1) shall be composed by the number of the implementing regulatory act or the latest amending regulatory act applicable to the EC type-approval. The number shall be followed by an alphabetical character reflecting the requirements of OBD and SCR systems in accordance with Table 1. (1) “NOx OTL” monitoring requirements as set out in Table 1 of Annex X for compression ignition and dual-fuel engines and vehicles and Table 2 of Annex X for positive ignition engines and vehicles. (2) “PM OTL” monitoring requirements as set out in Table 1 of Annex X for compression ignition and dual-fuel engines and vehicles. (3) “Performance monitoring” requirements as set out in point 2.1.1 of Annex X. (4) Reagent quality “phase-in” requirements as set out in point 7.1 of Annex XIII. (5) Reagent quality “general” requirements as set out in point 7.1.1 of Annex XIII. (6) “CO OTL” monitoring requirements as set out in Table 2 of Annex X for positive ignition engines and vehicles. (7) IUPR “Phase-in” requirements as set out in Section 6 of Annex X. (8) IUPR “General” requirements as set out in Section 6 of Annex X. (9) For positive-ignition engines and vehicles equipped with such engines. (10) For compression-ignition and dual-fuel engines and vehicles equipped with such engines. (11) Only applicable to positive-ignition engines and vehicles equipped with such engines. (12) Additional provisions concerning monitoring requirements as set out in paragraph 2.3.1.2 of Annex 9A to UNECE Regulation No 49. (13) IUPR specifications are set out in Annex X. Positive Ignition engines and vehicles equipped with such engines are not subjected to IUPR. (14) ISC requirement set out in Appendix 1 to Annex II. Normal payload is a payload between 10 and 100 % of the maximum payload. The maximum payload is the difference between technically permissible maximum laden mass of the vehicle and the mass of the vehicle in running order as specified in accordance to Annex I to Directive 2007/46/EC. For the purpose of in-service conformity testing, the payload may be reproduced and an artificial load may be used. Approval authorities may request to test the vehicle with any payload between 10 and 100 % of the maximum vehicle payload. In case the mass of the PEMS equipment needed for operation exceeds 10 % of the maximum vehicle payload this mass may be considered as minimum payload. 4.4.1. The test lubricating oil shall be market oil and must comply with the specifications of the engine manufacturer. Oil samples shall be taken. The test fuel shall be market fuel covered by Directive 98/70/EC and relevant CEN standards or reference fuel as specified in Annex IX to this Regulation. Fuel samples shall be taken. A manufacturer may request not to sample the fuel from a gas engine. 4.4.2.1. If the manufacturer has, in accordance with Section 1 of Annex I to this Regulation, declared the capability to meet the requirements of this Regulation on market fuels declared in point 3.2.2.2.1 of the Information Document as set out in Appendix 4 to Annex I to this Regulation, at least one test shall be conducted on each of the declared market fuels. 4.4.3. For exhaust after-treatment systems that use a reagent to reduce emissions, the reagent shall be market reagent and must comply with the specifications of the engine manufacturer. A sample of the reagent shall be taken. The reagent shall not be frozen. The shares of operation shall be expressed as a percentage of the total trip duration. The trip shall consist of urban driving followed by rural and motorway driving according to the shares specified in points 4.5.1 to 4.5.4. Where another testing order is justified for practical reasons and after the agreement of the approval authority another order may be used, however, the test shall always start with the urban driving. For the purpose of this Section, ‘approximately’ shall mean the target value ± 5 %. In case the trip composition is determined by means of the first acceleration method, the first acceleration above 55 km/h (70 km/h in the case of vehicles of categories M1 and N1) shall indicate the beginning of the rural part and the first acceleration above 75 km/h (90 km/h in the case of vehicles of categories M1 and N1) shall indicate the beginning of the motorway part. The criteria for differentiation between urban, rural and motorway operation shall be agreed with the approval authority prior to the beginning of the test. Average speed in urban operation shall be between 15 and 30 km/h. Average speed in rural operation shall be between 45 and 70 km/h (60 and 90 km/h in the case of vehicles of categories M1 and N1). Average speed in motorway operation shall be above 70 km/h (90 km/h in the case of vehicles of categories M1 and N1). 4.5.1. For M1 and N1 vehicles the trip shall consist of approximately 34 % urban, 33 % rural and 33 % motorway operation. 4.5.2. For N2, M2 and M3 vehicles the trip shall consist of approximately 45 % urban, 25 % rural and 30 % motorway operation. M2 and M3 vehicles of Class I, II or Class A as defined in UN/ECE Regulation 107 shall be tested in approximately 70 % urban and 30 % rural operation. 4.5.3. For N3 vehicles the trip shall consist of approximately 20 % urban, 25 % rural and 55 % motorway operation. 4.5.4. For the purpose of the assessment of the trip composition, the duration of the share shall be calculated from the moment when the coolant temperature has reached 343 K (70 °C) for the first time or after the coolant temperature is stabilised within +/– 2 K over a period of 5 minutes whichever comes first but no later than 15 minutes after engine start. In accordance with paragraph 4.5 the period elapsed to reach the coolant temperature of 343 K (70 °C) shall be operated under urban driving conditions. Artificial warming-up of the emission control systems prior to the test is prohibited. This Appendix describes the procedure to determine gaseous emissions from on-vehicle on-road measurements using portable emissions measurement systems (hereinafter ‘PEMS’). The pollutant emissions to be measured from the exhaust of the engine include the following components: carbon monoxide, total hydrocarbons and nitrogen oxides for compression ignition engines and carbon monoxide, non-methane hydrocarbons, methane and nitrogen oxides for positive ignition engines. Additionally, carbon dioxide shall be measured to enable the calculation procedures described in Sections 4 and 5. For engines fuelled with natural gas, the manufacturer, technical service or approval authority may choose to measure the total hydrocarbon (THC) emissions only instead of measuring the methane and non-methane hydrocarbon emissions. In that case, the emission limit for the total hydrocarbon emissions is the same as the one specified in Annex I to Regulation (EC) No 595/2009 for methane emissions. For the purposes of the calculation of the conformity factors pursuant to points 4.2.3 and 4.3.2, the applicable limit shall in that case be the methane emission limit only. Emissions sampling, measurement of the exhaust parameters and recording of the engine and ambient data shall commence prior to starting the engine. The coolant temperature shall not exceed 303 K (30 °C) at the beginning of the test. In case ambient temperature exceeds 303 K (30 °C) at the beginning of the test, the coolant temperature shall not exceed the ambient temperature by more than 2 °C. The data evaluation shall start after the coolant temperature has reached 343 K (70 °C) for the first time or after the coolant temperature is stabilised within +/– 2 K over a period of 5 minutes whichever comes first but no later than 15 minutes after engine start. Emission sampling, measurement of the exhaust parameters and recording of the engine and ambient data shall continue throughout the normal in-use operation of the engine. The engine may be stopped and started, but emissions sampling shall continue throughout the entire test. Periodic zero-checks of the PEMS gas analysers may be conducted every 2 hours and the results may be used to perform a zero drift correction. The data recorded during the checks shall be flagged and shall not be used for the emission calculations. The emissions shall be integrated using a moving averaging window method, based on the reference CO2 mass or the reference work. The principle of the calculation is as follows: The mass emissions are not calculated for the complete data set, but for sub-sets of the complete data set, the length of these sub-sets being determined so as to match the engine CO2 mass or work measured over the reference laboratory transient cycle. The moving average calculations are conducted with a time increment Δt equal to the data sampling period. 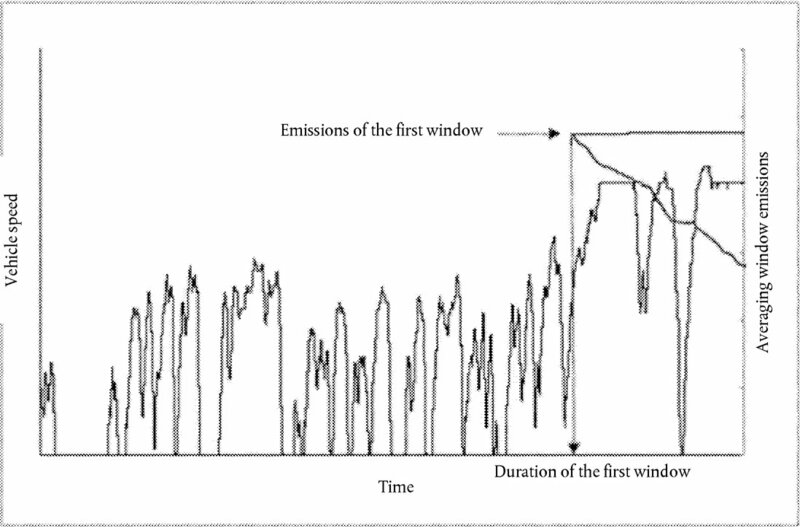 These sub-sets used to average the emissions data are referred to as “averaging windows” in the following points. Any invalidated data shall not be considered for the calculation of the work or CO2 mass and the emissions of the averaging window. the data outside the conditions specified in points 4.2 and 4.3 of Annex II. The mass emissions (mg/window) shall be determined as described in paragraph 8.4.2.3 of Annex 4 to UN/ECE Regulation No 49. 4.2.2.1. Before the dates referred to in Article 17a, points 4.2.2.1.1 to 4.2.2.1.4 shall apply. 4.2.2.1.1. The valid windows are the windows whose average power exceeds the power threshold of 20 % of the maximum engine power. The percentage of valid windows shall be equal or greater than 50 %. 4.2.2.1.2. If the percentage of valid windows is less than 50 %, the data evaluation shall be repeated using lower power thresholds. The power threshold shall be reduced in steps of 1 % until the percentage of valid windows is equal to or greater than 50 %. 4.2.2.1.3. In any case, the lower threshold shall not be lower than 15 %. 4.2.2.1.4. The test shall be void if the percentage of valid windows is less than 50 % at a power threshold of 15 %. 4.2.2.2. From the dates referred to in Article 17a, points 4.2.2.2.1 and 4.2.2.2.2 shall apply. 4.2.2.2.1. The valid windows are the windows whose average power exceeds the power threshold of 10 % of the maximum engine power. 4.3.1.1. Before the dates referred to in Article 17a, points 4.3.1.1.1 to 4.3.1.1.4 shall apply. P max is the maximum engine power, kW. 4.3.1.1.2. If the percentage of valid windows is less than 50 %, the data evaluation shall be repeated using longer window durations. This is achieved by decreasing the value of 0,2 in the formula given in point 4.3.1 by steps of 0,01 until the percentage of valid windows is equal to or greater than 50 %. 4.3.1.1.3. In any case, the lowered value in above formula shall not be lower than 0,15. 4.3.1.1.4. The test shall be void if the percentage of valid windows is less than 50 % at a maximum window duration calculated in accordance with points 4.3.1.1, 4.3.1.1.2 and 4.3.1.1.3. 4.3.1.2. From the dates referred to in Article 17a, points 4.3.1.2.1 and 4.3.1.2.2 shall apply. The installation of the EFM shall not increase the backpressure by more than the value recommended by the engine manufacturer, nor increase the length of the tailpipe by more than 2 m. As for the all the components of the PEMS equipment, the installation of the EFM shall comply with the locally applicable road safety regulations and insurance requirements.’. The Approval Authority shall require that the manufacturer provides a documentation package. This should describe any element of design and emission control strategy of the engine system and the means by which it controls its output variables, whether that control is direct or indirect. The information shall include a full description of the emission control strategy. In addition, this shall include information on the operation of all AES and BES, including a description of the parameters that are modified by any AES and the boundary conditions under which the AES operate, and indication of which AES and BES are likely to be active under the conditions of the test procedures in this Annex. For the purpose of the PEMS demonstration test, the payload may be reproduced and an artificial load may be used. The vehicle payload shall be 50-60 % of the maximum vehicle payload. The additional requirements set out in Annex II shall apply.’. 4.6.1. NOx control measures compatibility demonstration is required only when the original pollution control device was monitored in the original configuration. 4.6.2. The compatibility of the replacement pollution control device with the NOx control measures shall be demonstrated by using the procedures described in Annex XIII to this Regulation, for replacement pollution control devices intended to be fitted to engines or vehicles type-approved in accordance with Regulation (EC) No 595/2009 and this Regulation. 4.6.3. The provisions in UN/ECE Regulation No 49 applicable to components other than pollution control devices shall not apply. 4.6.4. The replacement pollution control device manufacturer may use the same preconditioning and test procedure as used during the original type-approval. In that case, the approval authority which granted original type-approval of an engine of a vehicle shall provide, on request and on a non-discriminatory basis, an information document presented as an appendix to the Information Document provided for in Appendix 4 to Annex I, which contains the number and type of preconditioning cycles and the type of test cycle used by the original equipment manufacturer for NOx control measures testing of the pollution control device. 1. This Appendix sets out the durability procedure referred to in point 4.3.2.4 of Annex XI, for the purpose of evaluating the emissions performance of a replacement pollution control device. 2.1. The durability procedure shall consist of a data collection phase and a service accumulation schedule. 2.2.1. The selected engine, equipped with the complete exhaust after-treatment system incorporating the replacement pollution control device, shall be cooled down to ambient temperature and run one cold start WHTC test-cycle in accordance with paragraphs 7.6.1 and 7.6.2 of Annex 4 to UN/ECE Regulation No 49. 2.2.2. Immediately after the cold start WHTC test-cycle, the engine shall be run for nine consecutive hot start WHTC test-cycles in accordance with paragraph 7.6.4 of Annex 4 to UN/ECE Regulation No 49. 2.2.3. The test sequence set out in points 2.2.1 and 2.2.2 shall be carried out in accordance with the instructions laid down in paragraph 7.6.5 of Annex 4 to UN/ECE Regulation No 49. 2.2.4. Alternatively, the relevant data can be collected by driving a fully loaded vehicle equipped with the selected exhaust after-treatment system incorporating the replacement pollution control device. The test can be carried out either on the road following the trip requirements of points 4.5 to 4.5.5 of Annex II to this Regulation with comprehensive recording of the driving data, or on a suitable chassis dynamometer. If an on-road test is chosen, the vehicle shall be driven over a cold test-cycle, as set out in Appendix 5 to this Annex, followed by nine hot test-cycles, identical to the cold one, in a way that the work developed by the engine is the same as the one achieved under points 2.2.1 and 2.2.2. If a chassis dynamometer is chosen, the simulated road gradient of the test-cycle in Appendix 5 shall be adapted to match the work developed by the engine over the WHTC. 2.2.5. The type-approval authority shall refuse the temperature data obtained under point 2.2.4 if it deems those data to be unrealistic and shall request either the repetition of the test, or the carrying out of a test pursuant to points 2.2.1, 2.2.2 and 2.2.3. 2.2.6. Temperatures in the replacement pollution control device shall be recorded during the whole test sequence, at the location with the highest temperature. 2.2.7. In cases where the location with the highest temperature varies over time, or where that location is difficult to define, multiple bed temperatures should be recorded at suitable locations. 2.2.8. The number and locations of the temperature measurements shall be selected by the manufacturer, in agreement with the type-approval authority, based on best engineering judgement. 2.2.9. With the agreement of the type-approval authority, a single catalyst bed temperature or the catalyst inlet temperature may be used if measuring multiple bed temperatures is proven to be unfeasible or too difficult. 2.2.10. The temperatures shall be measured and recorded at a minimum rate of once every second (1 Hz) during the test sequence. 2.2.11. The measured temperatures shall be tabulated into a histogram with temperature bins no larger than 10 °C. In the case mentioned in point 2.2.7, the highest temperature each second shall be the one recorded in the histogram. Each bar of the histogram shall represent the cumulated frequency in seconds of the measured temperatures falling in the specific bin. 2.2.12. The time in hours corresponding to each temperature bin must be determined and then extrapolated to the useful life of the replacement pollution control device, in accordance with the values specified in Table 1. The extrapolation shall be based on the assumption that one WHTC cycle corresponds to 20 km driving. 2.2.13. It is allowed to perform the data collection phase for different devices at the same time. 2.2.14. In the case of systems operating in the presence of active regeneration, the number, length and temperatures of the regenerations occurring during the test sequence defined in points 2.2.1 and 2.2.2 shall be recorded. If no active regeneration has occurred, the hot sequence defined in point 2.2.2 shall be extended in order to include at least two active regenerations. a value requested by the manufacturer, based on sound data and information, and agreed with the type-approval authority. 2.3.1. The temperatures recorded pursuant to points 2.2 to 2.2.15 shall be reduced to a reference temperature Tr , requested by the manufacturer in agreement with the type-approval authority, within the range of the temperatures recorded during the data collection phase. 2.3.2. In the case specified in point 2.2.13, the value of Tr for each one of the devices may vary. R = thermal reactivity of the replacement pollution control device. Tr = reference temperature, in K.
= mid-point temperature, in K, of the temperature bin i to which the replacement pollution control device is exposed during the data collection phase, registered in the temperature histogram. = the time, in hours, corresponding to the temperature , adjusted to a full useful life basis e.g. if the histogram represented 5 hours, and useful life is 4 000 hours according to Table 1, all histogram time entries would be multiplied by . = the equivalent ageing time, in hours, needed to achieve, by exposing the replacement pollution control device at the temperature Tr , the same amount of ageing as the one that would result from exposure of the replacement pollution control device at the temperature during the time . i = bin number, where 1 is number for the bin with the lowest temperature and n the value for the bin with the highest temperature. AT = total equivalent ageing time, in hours, needed to achieve, by exposing the replacement pollution control device at the temperature Tr , the same amount of ageing as the one that would result from exposure of the replacement pollution control device, over its useful life, to the temperature during the time of each one of the i bins registered in the histogram. n = Total number of temperature bins. 2.3.5. In the case referred to in point 2.2.13, AT shall be calculated for each device. 2.4.1.1. The service accumulation schedule shall allow acceleration of the ageing of the replacement pollution control device, using the information gathered during the data collection phase set out in point 2.2. 2.4.1.2. The service accumulation schedule shall consist of a thermal accumulation schedule and a lubricant consumption accumulation schedule in accordance with point 2.4.4.6. The manufacturer, in agreement with the type-approval authority, may not have to carry out a lubricant consumption accumulation schedule in case the replacement pollution control devices are placed downstream of an after-treatment filter component (e.g. diesel particulate filter). Both the thermal accumulation schedule and the lubricant consumption accumulation schedule shall consist of a repetition of, respectively, a series of thermal and lubricant consumption sequences. 2.4.1.3. In the case of replacement pollution control devices operating in the presence of active regeneration, the thermal sequence shall be complemented with an active regeneration mode. 2.4.1.4. For service accumulation schedules consisting of both thermal and lubricant consumption accumulation schedules, their respective sequences shall be alternated, so that for each thermal sequence that has to be performed, the following sequence corresponds to lubricant consumption. 2.4.1.5. It is allowed to perform the service accumulation schedule at the same time for different devices. In that case, a single service accumulation schedule shall be set for all the devices. 2.4.2.1. The thermal accumulation schedule shall simulate the effect of thermal ageing on the performance of a replacement pollution control device until the end of its lifetime. 2.4.2.2. The engine used for the performance of the service accumulation schedule, fitted with the exhaust after-treatment system incorporating the replacement pollution control device, is operated for a minimum of three consecutive thermal sequences, as set out in Appendix 4. 2.4.2.3. The temperatures shall be recorded over a minimum of two thermal sequences. The first sequence, conducted for warming up, shall not be taken into account for the purpose of temperature gathering. 2.4.2.4. The temperatures shall be recorded at suitable locations, chosen in accordance with points 2.2.6 to 2.2.9, at a minimum rate of once every second (1 Hz). = the effective ageing time, in hours, needed to achieve, by exposing the replacement pollution control device at the temperature Tr , the same amount of ageing as the one that would result from exposure of the replacement pollution control device at the temperature Ti during the second i.
Ti = the temperature, in K, measured in the second i, in each one of the thermal sequences. Diesel oxidation catalyst (DOC): 18 050. Tr = reference temperature, in K, being the same value as in equation 1. AE = Effective ageing time, in hours, needed to achieve, by exposing the replacement pollution control device at the temperature Tr , the same amount of ageing as the one that would result from exposure of the replacement pollution control device during the duration of the thermal sequence. i = number of temperature measurement. p = total number of temperature measurements. nc = thermal sequence number, of those conducted for the purpose of temperature gathering, in accordance with point 2.4.2.3. C = total number of thermal sequences conducted for the purpose of temperature gathering. optimising the engine settings without substantially changing the emission behaviour of the engine. 2.4.2.8. When applying the measures referred to in points 2.4.4.6 and 2.4.4.7, the total ageing time calculated from NTS shall not be less than 10 % of the useful life listed in Table 1, e.g. the vehicle category N1 shall not have an NTS of less than 286 thermal sequences, assuming that each sequence is 1 hour long. NTS shall be the same for each device, so that a single service accumulation schedule can be set up. In order to achieve the same NTS for each device, a first NTS value shall be calculated for each device, with its own AT and AE values. If the calculated NTS values are different, one or more of the measures set out in points 2.4.2.7 to 2.4.2.10 may be applied on the device or devices for which NTS needs to be modified, over the thermal sequences referred to in point 2.4.2.3, in order to influence the measured Ti and therefore conveniently speed up or slow down the artificial ageing of the targeted device or devices. The new NTS values corresponding to the new temperatures Ti obtained in point 2.4.2.10.3 shall be calculated. The steps set out in points 2.4.2.10.3 and 2.4.2.10.4 shall be repeated until the NTS values obtained for each device in the system match. The Tr values used for obtaining the different NTS in points 2.4.2.10.4 and 2.4.2.10.5 shall be the same ones as those used in points 2.3.2 and 2.3.5 for calculating AT for each device. The devices within the assembly may be either separately or jointly aged, in accordance with point 2.4.2.10. If the assembly is built in such a way that it is not possible to decouple the devices (e.g. DOC + SCR in a can), the thermal ageing of the assembly shall be carried out with the highest NTS . 2.4.3.1. The modified thermal accumulation schedule for devices operating in the presence of active regeneration shall simulate the effect of ageing due to both thermal load and active regeneration on a replacement pollution control device at the end of its lifetime. 2.4.3.2. The engine used for the service accumulation schedule, fitted with the exhaust after-treatment system incorporating the replacement pollution control device, is operated for a minimum of three modified thermal sequences, consisting each sequence of a thermal sequence as set out in Appendix 4, followed by a complete active regeneration, during which the peak temperature reached in the after-treatment system should be not lower than the peak temperature recorded in the data collection phase. 2.4.3.3. The temperatures shall be recorded over a minimum of two modified thermal sequences. The first sequence, conducted for warming up, shall not be taken into account for the purpose of temperature gathering. 2.4.3.4. In order to minimise the time elapsed between the thermal sequence as set out in Appendix 4 and the subsequent active regeneration, the manufacturer may artificially trigger the active regeneration by running, after each thermal sequence as set out in Appendix 4, the engine at a steady mode that enables a high production of soot by the engine. In that case, the steady mode shall also be considered as part of the modified thermal sequence set out in point 2.4.3.2. 2.4.3.5. The effective ageing time corresponding to each modified thermal sequence shall be calculated using equations 3 and 4. 2.4.3.6. The total number of modified thermal sequences to be conducted during the service accumulation schedule shall be calculated using equation 5. 2.4.3.7. It is allowed to reduce NTS , and consequently the duration of the service accumulation schedule, by increasing the temperatures at each mode of the modified thermal sequence, applying one or several of the measures set out in point 2.4.2.7. 2.4.3.8. In addition to the measures referred to in point 2.4.3.7, NTS can also be reduced by increasing the peak temperature of the active regeneration within the modified thermal sequence, without exceeding a bed temperature of 800 °C under any circumstances. NAR = number of active regeneration sequences over the useful life of the replacement pollution control device. tWHTC = equivalent number of hours corresponding to the vehicle category for which the replacement pollution control device is intended, obtained from Table 1.
tAR = duration, in hours, of an active regeneration. tBAR = time, in hours, between two consecutive active regenerations. 2.4.3.10. If, as consequence of the application of the minimum number of modified thermal sequences as set out in point 2.4.3.9, AE × NTS calculated using equation 4 exceeds the AT calculated using equation 2, the time of each mode of the thermal sequence set out in Appendix 4, and embedded in the modified thermal sequence as set out in point 2.4.3.2, may be reduced in the same proportion, in order to make AE × NTS = AT. 2.4.3.11. It is allowed to increase NTS and consequently the duration of the service accumulation schedule, by lowering the temperatures at each mode of the thermal-active regeneration sequence by applying one or several of the measures set out in point 2.4.2.9. 2.4.4.1. The lubricant consumption accumulation schedule shall simulate the effect of ageing due to chemical poisoning or deposit formation as a result of lubricant consumption, on the performance of a replacement pollution control device at the end of its lifetime. 2.4.4.2. The lubricant consumed, in g/h, shall be determined over a minimum of 24 thermal sequences or a corresponding number of modified thermal sequences, using any suitable method, as for example the drain and weigh procedure described in Appendix 6. Fresh lubricant shall be used. 2.4.4.3. The engine shall be equipped with a constant volume oil sump in order to avoid the need of “top-offs”, since oil level influences the oil consumption rate. Any suitable method, as for example the one described in the ASTM standard D7156-09, may be used. tTAS = theoretical duration, in hours, of the service accumulation schedule required to obtain the same lubricant consumption as the one corresponding to the useful life of the replacement pollution control device, provided that the service accumulation schedule is only made up of a series of consecutive thermal sequences or consecutive modified thermal sequences. LCRWHTC = lubricant consumption rate, in g/h determined as set out in point 2.2.15. LCRTAS = lubricant consumption rate, in g/h, determined as set out in point 2.4.4.2. N = number of thermal sequences or modified thermal sequences corresponding to tTAS . tTAS = theoretical duration, in hours, of the service accumulation schedule required to obtain the same lubricant consumption as the one corresponding to the useful life of the replacement pollution control device, provided that the service accumulation schedule was only made up of a series of consecutive thermal sequences or consecutive modified thermal sequences. tTS = duration, in hours, of a single thermal sequence or modified thermal sequence. 2.4.4.6. The value of N shall be compared to the value of NTS calculated in accordance with point 2.4.2.6 or, for devices operating in the presence of active regeneration, in accordance with point 2.4.3.5. If N ≤ NTS , it is not necessary to add a lubricant consumption accumulation schedule to the thermal accumulation schedule. If N > NTS , a lubricant consumption accumulation schedule shall be added to the thermal accumulation schedule. 2.4.4.7. A lubricant consumption accumulation schedule may not have to be added if, by increasing the lubricant consumption as described in point 2.4.4.8.4, the needed lubricant consumption is already achieved with the conduction of the corresponding thermal accumulation schedule consisting of the performance of NTS thermal sequences or modified thermal sequences. 2.4.4.8.1. The lubricant consumption accumulation schedule shall consist of a number of lubricant consumption sequences repeated several times, each lubricant consumption sequence being alternated with each thermal sequence or each modified thermal sequence. 2.4.4.8.2. Each lubricant consumption sequence shall consist of a steady mode at constant load and speed, the load and the speed being selected in such a way that the lubricant consumption is maximised and effective thermal aging is minimised. The mode shall be determined by the manufacturer in agreement with the type-approval authority, based on best engineering judgement. The engine shall be run for an appropriate period of time at the load and speed determined by the manufacturer in accordance with point 2.4.4.8.2 and the lubricant consumed, in g/h, shall be determined using any suitable method, as for example the drain and weigh procedure described in Appendix 6. Lubricant changes are to be completed at the recommended intervals. LCRLAS = lubricant consumption rate, in g/h, determined as set out in point 2.4.4.8.3.1.
tTS = duration, in hours, of a single thermal sequence, as set out in Appendix 4, or modified thermal sequence, as set out in point 2.4.3.2. NTS = total number of thermal sequences or modified thermal sequences to be carried out during the service accumulation schedule. 2.4.4.8.4. The lubricant consumption rate shall always remain below 0,5 % of the engine fuel consumption rate in order to avoid excessive ash accumulation on the front face of the replacement pollution control device. 2.4.4.8.5. It is allowed to add the thermal ageing due to the conduction of the lubricant consumption sequence to the AE calculated in equation 4. 2.4.5.1. The service accumulation schedule shall be built up alternating a thermal or a modified thermal sequence, as appropriate, with a lubricant consumption sequence. The aforementioned pattern shall be repeated NTS times, being the NTS value the one calculated either in accordance with Section 2.4.2 or with Section 2.4.3, as appropriate. An example of a complete service accumulation schedule is given in Appendix 7. A flowchart describing the development of a complete service accumulation schedule is given in Appendix 8. 2.4.6.1. The engine, fitted with the exhaust after-treatment system incorporating the replacement pollution control device, shall run the service accumulation schedule set out in point 2.4.5.1. 2.4.6.2. The engine used for the performance of the service accumulation schedule may be different to the engine used in the data collection phase, being the latter always the one for which the replacement pollution control device to be type-approved has been designed, and the one to be tested for emissions under point 2.4.3.2. 2.4.6.3. If the engine used for the performance of the service accumulation schedule features a larger displacement by 20 % or more than the engine used in the data collection phase, the exhaust system of the former should be equipped with a by-pass in order to replicate as closely as possible the exhaust flow rate of the latter at the ageing conditions selected. 2.4.6.4. In the case referred to in point 2.4.6.2, the engine used for the performance of the service accumulation schedule shall be type-approved under Regulation (EC) No 595/2009. In addition, if the device or devices under test are intended for being fitted in an engine system with exhaust gas recirculation (EGR), the engine system used for the service accumulation schedule shall also be fitted with an EGR. If the device or devices under test are intended for not being fitted in an engine system with EGR, the engine system used for the service accumulation schedule shall also not be fitted with an EGR. 2.4.6.5. The lubricant and the fuel used in the service accumulation schedule shall be as similar as possible to those used during the data collection phase set out in point 2.2. The lubricant must be in line with the recommendation of the engine manufacturer for which the pollution control device is designed. The fuels used should be market fuels fulfilling the corresponding requirements of Directive 98/70/EC. On the request of the manufacturer also reference fuels in accordance with this Regulation can be used. 2.4.6.6. The lubricant shall be changed for maintenance, at the intervals scheduled by the manufacturer of the engine used in the data collection phase. The sequence of the modes 1 to 11 has been arranged by ascending load in order to maximise the temperature of the exhaust gas in the high load modes. With the agreement of the type-approval authority, this order can be modified in order to optimise the temperature of the exhaust gas if this can help in reducing the actual aging time.